Layers contains object of various kind that you may want to render differently from the default style. 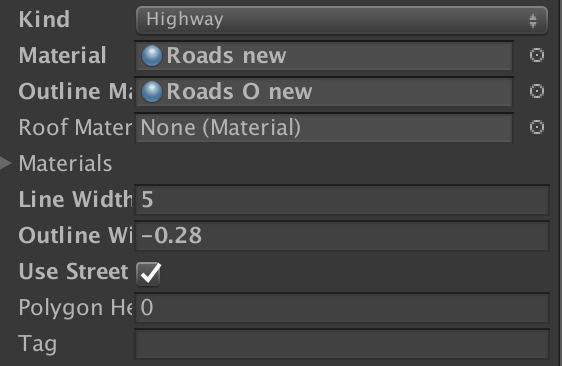 If a rendering option is added the object will use the values specified in it instead of defaults. https://mapzen.com/documentation/vector-tiles/layers/ for a full list of map “kinds”. The rendering option used for “defaultRendering” has to always have “BaseKind” as the GOFeatureKind parameter. (GOFeatureKind) Kind: the kind to override. (Material) material: the material used to render objects of that kind. (Material) outlineMaterial: material used for the roads outline. (Material) roofMaterial: the material used to render rooftops. (List)materials: A list of materials to be used for this kind of object. One of them is chosen randomly. The random has a seed based on gps coordinates so it’s always the same among the various builds/users of GoMap. (int) lineWidth: width of the lines (lines only). (int) outlineWidth: the witdh of the road outline. (bool) useStreetNames: when possible tells GoMap to render stretnames for this kind of features. (int) polygonHeight: height of polygons (polygons only). (int) tag: the unity tag used for this kind of objects. Note that you’ll have to add tags manually to your project in order to make this feature work.